It's an odd advertising slogan. I mean, would you own up and buy a Porsche after that? My first car was a '51 Anglia, my other toy, in addition to my '66 Cortina is a 1990 Porsche. Apparently I don't care one way or the other. 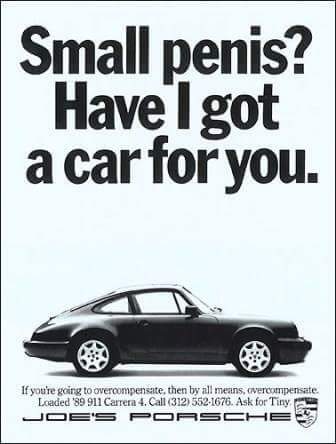 I just think it was odd advertising in '89 only at this single Porsche dealership. Maybe Joe wasn't selling enough cars at the time. Looks like I have the wrong car. Gotta sell the GT and buy a Porsche.